When you enter Red Dog Saloon you know you are in a BBQ restaurant. Many things died to make this place what it is. It isn’t just what arrives on your plate but the vast amounts of dark wood that line its walls and the odd skull that adorns them. That said it is still more palatable than any other of Nottingham’s American restaurants. One of my favourite things was the existence of a happy hour on beer (before 7pm I think) though I’m not sure I would be quite so happy in paying £5.15 a pint! The offering isn’t very different from the competition when it comes to the menu, a number of burgers and straight up meats dominating the choices. To try and sample a few of these I decided to share a platter with 2 friends. It was designed for 2 so we ordered a few sides and figured we could always order more if it came up short. It arrived in rapid fashion, which makes sense as almost all of it will have been cooking for hours already – BBQ should be “low and slow” after all. It was, of course, served on a big wooden board that is probably the bane of the waiting staff given its weight. Let me address our array of sides first; fries were forgettable but fine, onion rings thin and crispy but lacking seasoning. The beans were “meaty” beans which always frustrates me, I want something contrasting in flavour to the other pile of meat you are having. On to the meat, but the poor cousins first. Chicken was good filler, moist enough but never really ignites my fires when piles of beef are close at hand. 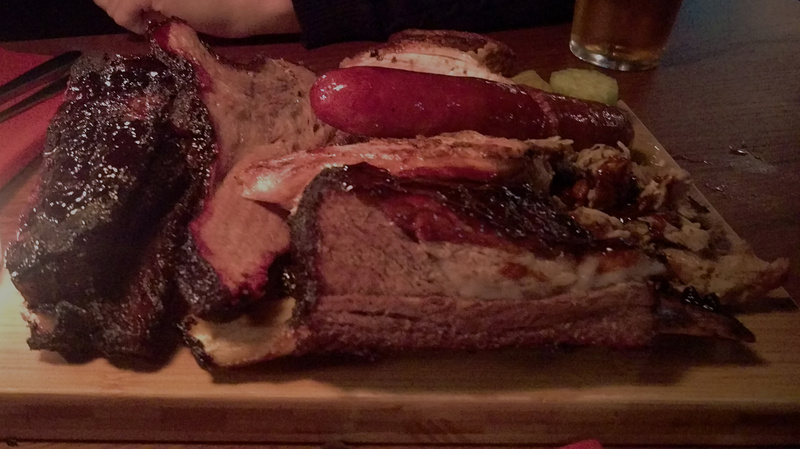 A sausage was rather good, whilst alarmingly red in colour, decent smokiness with a good texture. The pulled pork was the most disappointing item of the evening; it wasn’t very…pulled. Small chunks of pork that didn’t have much BBQ flavour. In contrast I thought both the rib and brisket were good – mostly moist they had a deeper, darker look and taste than the rest of the platter. 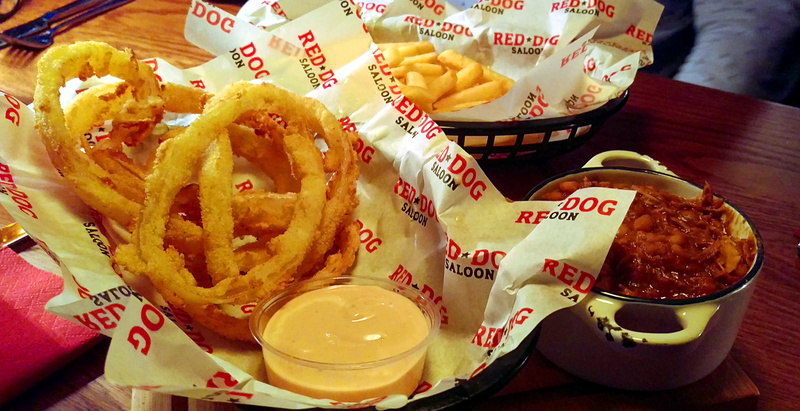 Red Dog Saloon had 1 table sauce, which compared to other restaurants is limited from a condiment perspective. Fortunately for them it was probably the best of any table sauce I have had – sweet, sticky smoky (which was a good job as a few of the items did need livening up). So if you need to decide where to eat your meat, I can’t say one stands above the others. You might have your own favourite but there is no universal winner. Well, maybe the slaughterhouse.